SciLog offer a wide range of programmable pumps, to suit your process needs, including precision metering, dispensing and TFF flow. 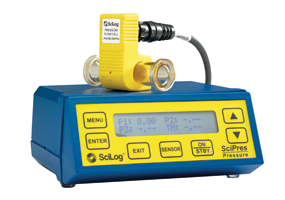 The SciPres Single Use Pressure Sensors accurately measure the pressure within your process. Allowing for programmability, they are a fully automated, walk away system, that gives peace-of-mind. The SciPres pressure sensors can handle up to 3 pressure sensor inputs (P1, P2 and P3) simultaneously and have a user selectable readout permitting the display of transmembrane pressure (TMP) and differential pressure (dP). Each sensor is preprogrammed and barcoded with a unique ID for easy traceability and data documentation when combined with the SciLog SciDoc software. Factory calibration data is also stored on each sensor's chip for out-of-box, plug and play use. The SciPres comes in 5 different sizes to fit a variety of tubing sizes: Luer, 3/8" barb, 1/2" barb, 3/4" Sanitary, and 1.0" Sanitary. To further discuss the Single Use Pressure Sensors, and how we can help you to find the perfect solution to keep your process under control. Please contact us, or request a callback at a convenient time to suit you.